I like watercress. I like it in sandwiches, sometimes as a single filling, sometimes with Wensleydale or Cheshire cheese. I put it in stir-fries and salads—it plays well with beetroot. I make watercress lasagne, and of course, soup. As that report points out, watercress is not widely used in this country. In Europe and Asia it’s a popular vegetable sold in shops and markets, but in Australia and New Zealand we’re more likely to encounter it as a weed. 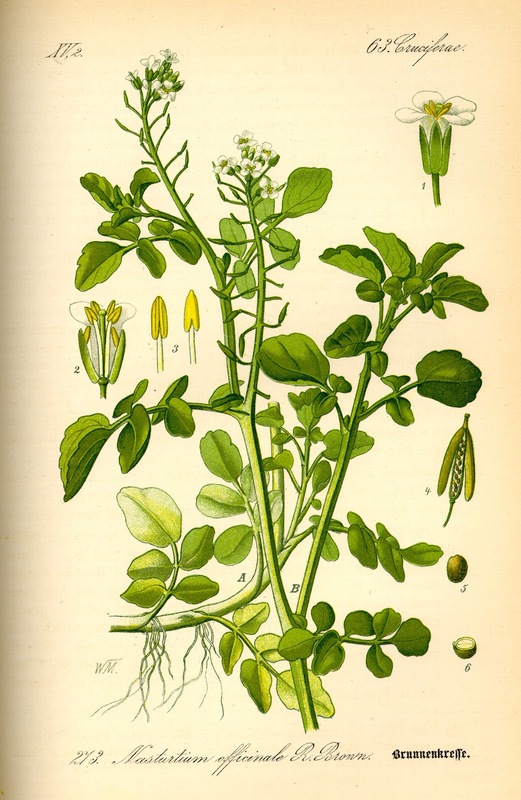 Yet watercress has been part of the culinary repertoire for a long time. It was prized by the ancient Greeks and Romans. It’s mentioned in a play by Aristophanes (Clouds). The Romans ate it with oil and vinegar and believed its consumption promoted clarity of thought and bold decision-making. 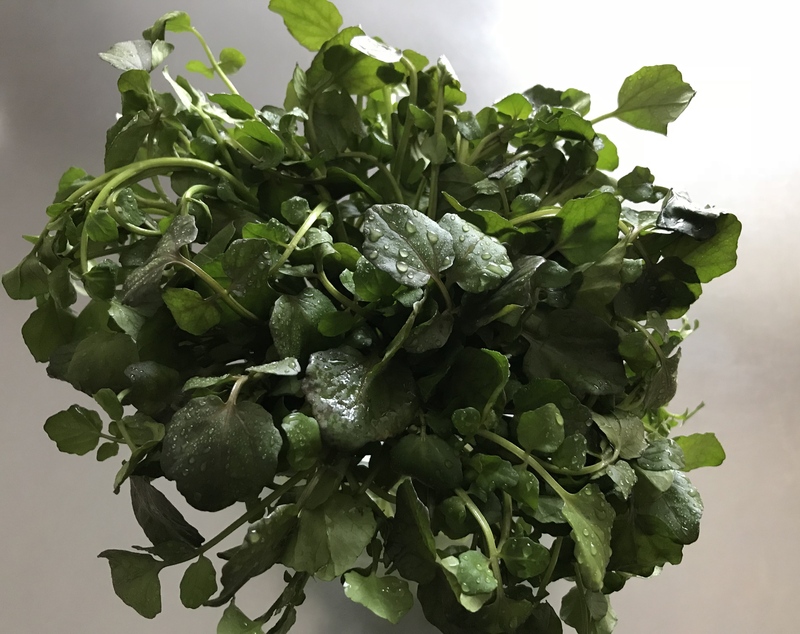 Although watercress was first cultivated in Germany during the sixteenth century, it wasn’t farmed commercially in Britain until the nineteenth. The development of the railway system made it possible to transport carriage-loads of the plant from beds in England’s southern counties to London’s Covent Garden Market. A food of the poor, watercress helped at least one poor girl make her fortune. Eliza James, who earned the nickname the Watercress Queen, began her business career at the age of five hawking bunches of the wild stuff to factory workers. She ended up with a near monopoly supplying the vegetable to London’s restaurants and hotels. How watercress arrived in Australia remains open to debate. Likewise whether it was a deliberate or accidental introduction—or some combination of both. A member of the mustard family Rorippa nasturtium-aquaticum, also known as Nasturtium officinale, is found in waterways, wetlands, drains and irrigation channels—pretty much anywhere damp and not too hot, in fact. At one stage it was declared a noxious weed in Queensland and it’s listed here in my 2011 edition of Weeds of the South East as widespread in all states. Unlike those nineteenth century New Zealanders I don’t see watercress as a breakfast food. For me it’s a lunchtime sandwich. Or Alexandre Dumas’s winter salad. The author of The Three Musketeers and The Count of Monte Cristo, by all accounts a fine cook, also penned a Grand Dictionnaire de Cuisine (Great Dictionary of Cooking). ‘Le cresson de fontaine est aussi une salade d’hiver, et on l’assaisonne habituellement avec des tranches de betteraves et quelques filets d’olives tournés.’ Watercress is also a winter salad, and is usually seasoned with slices of beetroot and some pitted olives. I think my favourite way of eating watercress is as a soup. A lot of recipes use flour and cream or other dairy products. I thicken mine with potatoes. Sauté a diced onion in olive oil and a little butter (omit the butter for a vegan version), add a crushed clove of garlic. While the onions cook, cut up 2 large potatoes and put them into the pot. Add vegetable stock, some parsley, salt, lots of pepper, nutmeg to taste, and cook until the potatoes are soft. Rinse your watercress (you need a couple of bunches) and discard any thick stems. Long cooking robs watercress of its punchy bite, so I blanche it then add it to the pot for just a couple of minutes’ cooking. I use a stick blender to liquidise it—but not too much, I like my watercress soup with a bit of texture.